On July 20, 1944, Colonel Claus Schenk Graf von Stauffenberg was executed in the courtyard of the Third Reich’s military headquarters in Berlin for attempting to assassinate Adolf Hitler. A member of the unsuccessful plot to overthrow the Nazi government — codenamed Operation Valkyrie — Stauffenberg was shot by a firing squad along with his co-conspirators, and their bodies were dumped in a shallow grave. Most discussions of German resistance during World War II end here, with the failed July 20 plot and the subsequent execution of its leaders. And yet this was far from the last act of disobedience carried out against the Nazi regime, as Randall Hansen reveals in his fascinating new book. Although “resistance” as a commitment to regime change all but ended with Stauffenberg, Hansen shows that if we consider resistance as disobedience — of orders to detonate a bridge, to wreck a factory, to destroy a harbor or to defend a city to the last man — then a very different picture emerges. Resistance-as-disobedience continued, and indeed increased, throughout late 1944 and early 1945. And it had a more profound and lasting material effect on the war and its aftermath than did the military resistance culminating in Stauffenberg’s attempt on Hitler’s life. From the refusal to destroy Paris and key locations in southern France to the unwillingness to implement a scorched earth policy on German soil, disobedience in the Third Reich manifested in numerous ways after 1944, and ultimately impacted the course of the war by saving thousands of Allied and German lives, keeping supply lines open, and preserving cities and infrastructure. In a period of thorough and at times fanatical obedience, the few instances of disobedience against the Nazi regime become all the more striking. 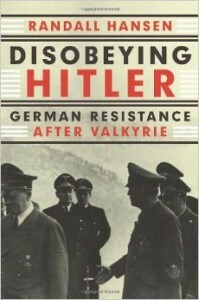 Considering various forms of oppostion across the Western Front, Disobeying Hitler is a significant contribution to the literature on German resistance.